Larry and Pete stopped by to give rides to folks. Well … they didn’t give them away! 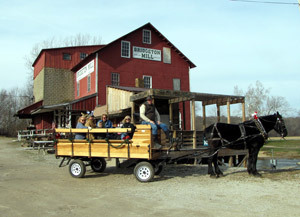 Covered Bridge Christmas was very good this year (last weekend of Nov and the first weekend of Dec.) … lots of folks came to stock up on Bridgeton Mill’s fresh stone ground products. They know we will be closed until spring. It has been a wonderful year. Oh yeah …. Pete is the horse.